Fiddle Quilts are highly visual, tactile, quick to make quilts designed to soothe and stimulate people living with dementia. These small quilts, incorporating fabrics with different textures and pictures, with pockets, flaps, zips etc added are ideal for people who have restless hands and like repetitive activities. A Fiddle Quilt provides an excellent way to give fretful hands “something to do” while also providing visual and tactile stimulation and establishing an interest in something tangible. 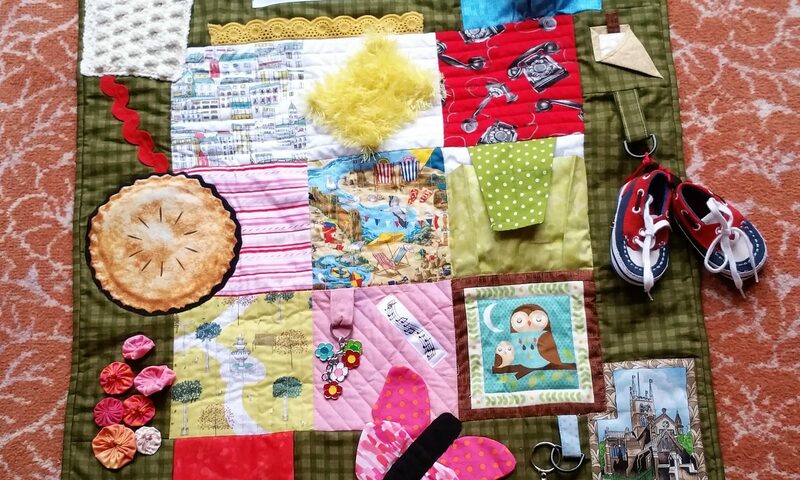 The best Fiddle quilts are designed in a way that sparks memories and stimulates conversation about the person’s life and interests through careful choice of fabric and fiddly bits. We want to promote the making of fabulous Fiddle Quilts in a learning and enabling style. This means bringing together and disseminating information about best practice in an accessible way, and providing direct support by doing talks and running workshops. We are very grateful to the people we have already met in our travels from whom we have learnt an awful lot.